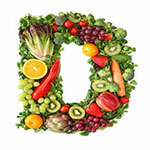 Vitamin D plays an important role in bone health, and research shows that it's essential for immune health as well. Older individuals who are deficient in vitamin D tend to have lower immune function, finds a new study in the Journal of Endocrinology & Metabolism. "The results indicate immune function may be compromised in older individuals with vitamin D deficiency," report researchers, adding that ensuring older individuals have adequate vitamin D levels may help to boost immune function. "This study is the first to find a connection between vitamin D levels and inflammation in a large sample of older individuals." To determine whether you're deficient, ask your healthcare practitioner for the blood test for 25-hydroxyvitamin D3, or 25(OH)D3. For optimum health, blood levels should be between 50 to 80 ng/mL.